"Moeen Ali is a good cricketer with potential and has had moments where he has done well for England. But he's not Jim Laker, or Graeme Swann. He is making his way in the game and I would have left him at Worcester to play county cricket and get games under his belt." "Take Ben Stokes' figures and Chris Jordan's figures, they're very good. But they're not penetrating. You're better off with bowlers who are expensive. We need someone who gets wickets. And it's all very well having bowlers who can bat, but we don't need all that batting on this pitch. We need different bowlers. Bowling for maidens and good figures doesn't win you Test matches." Well, a tough, chastening day for England. Optimism was high in the morning when Joe Root skipped to 182 not out as the tourists built a lead of 165, before James Anderson removed Devon Smith before lunch. From then on in, it was all West Indies. Kraigg Brathwaite batted with super concentration and resolve to reach his fourth Test hundred, and he was well supported by Darren Bravo and Marlon Samuels as West Indies wiped out England's lead and built a slender advantage of their own. England have it all to do tomorrow to earn their first away Test win since 2012. As for West Indies, they will simply look to bat on...and on...and on. "I don't think England have imagination. They do the sensible, conservative things. With a Test side you need imagination. We should be polishing off the West Indies on any surface. We're in a winning draw position but someone is going to have to come up with something tomorrow." West Indies batsman Kraigg Brathwaite on Sky Sports: "I kept working hard and I'm very proud. I grew up watching England so I'm very happy to make a hundred. England were aggressive at the start and I thought they bowled really well. I learned my powers of concentration from my father - I used to bat really fast! We start afresh tomorrow and take it from there." It'll be Chris Jordan to cap off a thoroughly disappointing day for England with the ball. Samuels blocks it out for a maiden, and that is a job very well done indeed by the West Indies - they've lost only two wickets in 75 overs, and hauled themselves back from a position of real jeopardy. "Kraigg Brathwaite, at 22 years and 144 days, is the third West Indian to reach four Test centuries, after George Headley and Gary Sobers." "Brathwaite thoroughly deserves his hundred. He's played well. He's no Greenidge or Haynes on the eye but he occupies the crease and hats off to him. He's thwarted everything England have thrown at him." He's got it! In the fading light, Kraigg Brathwaite brings up his fourth Test hundred with two past cover point. That's a terrific effort from the young man, who may not be the most dashing strokemaker but has been able to repel everything England have tried to get him out today. Chris Jordan switches ends. Samuels knocks a single to midwicket to bring up the 50 partnership, before Brathwaite moves on to 99 with a nudge to long leg. Samuels then creams Jordan through extra cover for four. England just want this to be over now. Joe Root looks absolutely cream-crackered - he runs around to prevent a Brathwaite single at point and stays down on his haunches for a full standing eight count. The returning Jimmy Anderson keeps Brathwaite pinned on 98. "England have tried things and varied their field but are getting nothing from the pitch and are a bit predictable. Batting is too easy. "I don't think you need four seamers. I'd love to find a space for Adil Rashid to play. I think he's a better bowler than Bishoo and he could produce the odd magic ball." Three distinguished sunhats arranged in a catching cordon on the leg-side: Anderson, Broad, and Cook lie in wait for a rash flick from Brathwaite. Jordan spoils the cunning plan, like a bungling jewel thief activating the laser tripwire, by spraying one down the off-side, which Brathwaite merely helps on its way down to the third-man boundary. Michael Dickie: Which is true? Brathwaite is now closing in on his fourth Test hundred - are century nerves England's best chance of getting him before the close? He moves on to 93 with two to cover point and a single to square leg. Five overs left - can he get there? Brathwaite moves into the 90s with a single to square leg. Oh no, there's a big inside edge. That's torn it. England lose a review, and Brathwaite hangs on. "Playing on these types of surfaces is just dull. Yes, you have to show some concentration and resolve but you would expect that from cricketers playing Test cricket." Moeen's had a rotten Test match so far - he ran himself out without scoring and he's really struggled with the ball. Is this merely a blip, or the end of his honeymoon period in Test cricket? We will see. Brathwaite works him to deep midwicket for two. "I've been impressed by Brathwaite. He's old-fashioned in the way he plays, has got a good technique and he likes that cut shot. All the West Indies players have kept to their favourite areas of scoring." Brathwaite and Jordan, in case you hadn't already heard this nugget, went to the same school in Barbados. Rihanna was also a pupil, if I'm not much mistaken. Brathwaite drives through cover for three. Graeme: If Ashley Giles was the King of Spain, Moeen Ali must be the King of the Long Hop he bowls two every over. It's not happening for Moeen here - he's getting the ball to grip but he's just not consistently finding the right areas in order to build pressure and threaten the bat. England's fielding has been good though, and Stokes does well to cut off a single at cover. Dave Wilson: Is this pitch really flat? Or is it just two average bowling attacks struggling? I bet Australia, South Africa and New Zealand bowlers would threaten more. Writing WI at the top of these entries keeps making me think of the Women's Institute. If Kraigg Brathwaite had a baking speciality, it would surely be rock cake - slightly homespun perhaps, but solid and not prone to crumble. Samuels would be something a little more stylish, with a bit of spice - an iced cinnamon sponge, perhaps. Jordan hustles through another over for the loss of a single. Ah, that's more like it, Brathwaite dabs Moeen through gully for two. England's spinner is continuing to look impotent here. Nick: Arthur Milton made his Test debut in 1958 making him a double international (football and cricket). He opened that day with MJ Smith, a double international in cricket and rugby union. Milton then made a hundred on debut. Television has just shown Kraigg Brathwaite's wagon wheel against seam in the last five Test matches. The V between cover and backward point was streaked with purple lines, the rest of the pitch was virtually bare. A man who knows his strengths and sticks to them. He rings the changes with a single to mid-on. "The crowd are very vocal now, gearing up for the end of play. There's always a tremendous party, the DJ cranks it up." Moeen, who's looked as rusty as an old spade in this match, continues. He's served up a few short balls in this spell and there's another one, pulled for two by Brathwaite. Sarah Clarke: Clare Taylor MBE is a former double international AND postie. Football and cricket for England (and Yorkshire), worked for Royal Mail. Brathwaite has really gone into his bunker since tea - he's crawled from 68 to 75 in the 70 minutes or so since the break. But who can reproach him - he's done superbly to marshal West Indies into the lead with eight wickets still in hand. Mark Savile: Time to take Root off, economical but not threatening. Give the poor lad a rest after his monumental efforts! Root errs with a horrible delivery that slides miles down the leg and presses a scampering Jonathan Trott into service to prevent it reaching the rope. West Indies have caught up with England's total - any runs from here on in take them into the black. Seconds out, round two. Samuels blocks out Stokes for four dots, then pushes a single. This isn't quite as popcorn-worthy as we'd hoped so far. Come on, whack him Marlon! Bounce him Ben! What happened to you guys? Thank you Stephan. West Indies just creeping up on the England total, like a cyclist settling into the slipstream of his opponent, poised for the inevitable overtake. Root's golden arm hasn't quite displayed its usual lustre today, and when he drops short, Brathwaite bunts him to the square-leg boundary, narrowly missing the man at short leg. Andy: Italia 90 England squad member Neil Webb became a postman in Reading. Ben Stokes gets the chance he's been waiting for since last night, marking out his run with Marlon Samuels on strike. It's strangely subdued to begin with - no chat, no histrionics, just a drive through the covers for a couple. If you'd had that on pay-per-view, you'd be disappointed with the first round. On come the drinks, so I'll give way to James Gheerbrant. Wayne: I have it on good authority (my mate Barry who used to be a roadie for Hawkwind - or so he says) that the England team have organised a Red Arrows flypast to coincide with Marlon's dismissal. Can't wait! Steve Hepton: Plunkett and Rashid both in for the next test or it'll be a drawn series. Sometimes you have to take risks to win! Matt Roberts: You're not going to win a test match with your two 'strike' bowlers bowling below 80mph. Jim, that is excellent chat, opening up the very niche conversation of sporting postmen. Samuels, as he does, is staying leg-side of the ball, slashing Broad behind point for a couple with the follow through of Rory McIlroy. Broad, though, is giving Marlon a decent examination around the off stump, sending numerous cherries down Geoffrey's Corridor of Uncertainty. I once had some trouble in the Corridor of Uncertainty. Couldn't find the bathroom. Jim Sheeran in Bristol: My postman in the 1990s was the last man to play cricket and football for England, Arthur Milton, a Bristolian who played for Arsenal and Gloucestershire. Stokes is dropping the least subtle hint that he wants a bowl, wheeling his arm around like a man trying to take off. I wonder if he's got a plan for a send-off to Samuels? A little dance? A sign? A guard of honour? Still the turgid battle between Root and Braithwaite. More dots than Bletchley Park. "If a guy gets runs in the first innings, they often come out full of self-confidence in the second innings. What this field does is encourage Marlon Samuels to really go for any ball that is there to be hit, which brings the two slips and gully into play." Samuels has plenty of company as Broad gallops in. Two slips, a gully, two catchers on the off side, one on the leg. Ooooffff, that's a flirt with danger throwing his hands through a wide one to loft over those two straight catchers for four. Was that Ben Stokes chirping up earlier in the over? Maybe not directly at Marlon, but still with something to say. Did Bravo have to play at that? I'm not sure. Broad's angle from round the wicket perhaps just drew him into poking at one that would not have troubled the off stump. Ultimately, England have winkled Bravo out and can have a go at their mate Marlon. I wonder if Ben Stokes is starting to wheel his arms around? For now, he watches various versions of Kraigg Braithwaite defending a Joe Root maiden. Ed Mehen: Finally a wicket! Only 4 hours since the last one. Come on England, get it going! David: If Cook doesn't give stokes a bowl at Samuels he is a joke of a captain. Should be an easy it's your moment Ben, win this Test. Here's fun, Marlon Samuels is the new man. Ben Stokes makes a point of covering his mouth as Samuels walks to the crease, not saying a word. Either that, or he's trying to stifle his laughter. "The patience pays off for England. Stuart Broad persisted with the off-side field, Bravo was a little bit lazy with his foot movement and got a little tickle behind. This is a time to try and get wickets in clusters." Gone! Do not adjust your screen, England really have made a breakthrough. The plan to bore out Darren Bravo has worked, with Stuart Broad the man to get a little tickle through to Jos Buttler. The ball was consistently hung outside the off stump and, in the end, Bravo was just half-heartedly poking with a defensive stroke. After what seems like three days of trying, England have opened up and end. Stewart Pickering: Anybody mentioned Andy Goram? Only man to have played International Cricket and Football for Scotland. Was playing cricket whilst a pro footballer up until 1991 when Walter Smith told him to concentrate on his football. Joe Root continues his longish spell, round the wicket to the right-handed Brathwaite, who almost chops on to his stumps when trying to cut one that gets a little too close. On Chanderpaul, his son is named Tagenarine, but my man James Gheerbrant tells me that he is referred to as 'Brendan'. How bizarre. While we're on the subject, why is Jonathan Trott's nickname 'Booger'? "You can see some fight in the West Indies team, which they haven't had for some time. They fought doggedly to stave off defeat in the first Test and they are fighting hard to erase the deficit in this match." The ageless Shiv Chanderpaul waits with pads on and warpaint under his eyes. Surely the only Test cricketer in the world to live in the USA (Florida), he is also old enough (40) for his son to have played nine first-class matches. Shiv has a bowling machine at his house, which I'm told he gets his wife to feed. Brilliant. He'd get into my favourite cricketers XI, even if he does bat like he's made from Meccano. Anderson bowling, absolutely nothing happening. Martin on a train from Manchester: World cricket needs a strong West Indies team. At our best we are a damn sight more entertaining than England. Who does Ben Stokes think he is sledging people's after a 5 minute career. Not fit to lace Malcolm Marshall's boots. He never sledged anybody just took wickets. In the stands, an England fan is lying across four of the blue plastic seats, zonked out. If he's asleep, I hope he's got suncream on, otherwise lobster will be on the menu. Root to Bravo, dropping short to be cut for four. The Windies edge towards a lead. They could be 50 or 60 by the close. I wonder if England will have a nervous final day with the bat. "There's been a huge amount of energy from the England fielders but the West Indies have played well. I thought it might spin more than it has but if anything the pitch has got better." The problem with Anderson's plan is that if he gets it wrong, Bravo can free his arms to drive. That's exactly what happens, four down the ground. Jimmy's speed down below 80mph for that delivery too. The evening party just seems to be starting - plenty of horns and cheers. I bet there's a drink or two to be had as well. I bet a Friday night out in Grenada is goooood. Almost as good as a night in Hanley. Oli: Cook's bowling choices: rfm, or rfm, or rfm, or rfm... And part time offy or part time offy. Captaincy is tough. What you can accuse England of is a lack of variety. They have four right-arm medium-fast bowlers and two right-arm off-spinners. When the ball doesn't move in the air, they are very one (or maybe that should be two?) dimensional. Joe Root, who in all honesty is bowling with greater accuracy than Moeen Ali, ties Brathwaite up for another maiden. Daniel: Team we think England aren't going to do it today so we've repaired to BB's Crabback in Grenada's St George harbour. You can't say that England haven't stuck to their task, or that they are lacking skill/creativity. This plan of Anderson's, round the wicket to Bravo with the off side stacked, is both unusual and hard to execute. A master of accuracy, Jimmy continues to bowl on the same blade of grass, playing on Bravo's patience, which is holding. For now. "England have to keep telling themselves that if you get one wicket, you can get two. They know that West Indies can self-destruct." Remarkably, Kraigg Brathwaite hadn't faced a single delivery in the first four overs after tea, with Bravo hogging all the strike. Now, he faces Root from round the wicket, with three catchers for company. Root and his blond locks, shuffling in, all on the money. Brathwaite plods forward, presenting a face of the bat that is covered in red smears. A maiden. "If there was one man in this match who you would have a few dollars on taking a chance like that, it would be Chris Jordan. It was an extraordinary shot." Darren Bravo seems to fancy a bit of James Anderson and it almost costs him his wicket. The left-hander aims a huge drive at Anderson, the ball flying aerially to the right of mid-off, that fielding superman Chris Jordan. Jordan shimmies, then leaps goalkeeper-style, the ball just evading his right hand. This round-the-wicket stuff has produced a good contest between Anderson and Bravo, who won't want to be going aerial near Jordan too often. Howard Horner: Brendon McCullum kept Dan Carter out of the South Island Schools rugby team in 1999. That's insanely impressive. Root stays round the wicket, putting lots of shoulder into some low-arm, skiddy off-breaks. When he drops short, Bravo flirts past slip for four, notching his 10th half-century in Test cricket. He and Brathwaite are doing a fine job, their partnership worth 126. Which team is happier at the moment? "That Anderson over was more threatening than the whole of the afternoon session." James Anderson, the big dog in England's yard, shares the evening attack. Interesting field - a slip, two gullies and a couple of catchers on the off side. The unorthodoxy may have just inside Darren Bravo's head. Off-stump line from round the wicket, one play and miss with a flash that falls short of the gullies. I remember Anderson employing a similar tactic to Kumar Sangakkara with some success at Lord's last year. Good stuff, the first sign of danger in a long time. Ian: Picking Stokes and Jordan doesn't make sense to me. They both offer OK batting and bowling. Why not exchange one for the aggression of Plunkett or wiliness of Rashid? Joe Root may be a very capable bowler, but it's a sign of where England are in this game when he begins the bowling this session. Some turn for Joe, beating Bravo, causing the bowler to give a little dance. Let's say the Windies draw level for the loss of only one wicket - would they be on top? "With Jordan batting at nine, England should no worries about their batting. They could play anything, something different. Instead, it's a very stereotype attack." There were some rather ceremonial-looking policemen on the outfield during the interval, but they have now given way to a rather hit-and-bothered looking England team. There are 36 overs remaining in the day. Could be a long session. Daisy Christodoulou: Jim Standen won FA Cup for West Ham and County Championship for Worcs in same year, 1964. Goalkeeper & medium-pace bowler. Thanks, James. That session was flatter than month-old lemonade, wasn't it? If you've decided that a Friday night out is more interesting than this Test match, I don't blame you. However, do let me know if you're barside. We'll even put some pics in if you're moved to take one. So, England have still plenty more work to do to win this match. They will be desperate to break this terrifically resolute partnership, while West Indies will simply want to keep batting as long as they can. The pitch has been unhelpful, but England's bowlers were still guilty of a lack of any real penetration - they scarcely created a chance. A few wickets are needed in the evening session to restore the fortunes of Alastair Cook's men, who must be wondering if that first away win wince Kolkata in 2012 will ever come. "I like what Cook was doing at the end in setting aggressive fields and changing the bowlers around. Nothing much was happening but he is trying to make something happen. I am still pretty confident England can four or five wickets at the end of the day but they need something to happen pretty fast." "England are under big pressure to win this series but it's a tough ask on these pitches. That makes the comments by the incoming chairman hard to fathom. He was trying to be a plain-speaking Yorkshireman but he just piled pressure on the players." Brathwaite sweeps for four to end a superb session for the West Indies and a hugely frustrating one for England. Hats off to Brathwaite and Bravo - they've batted splendidly. "Joe Root's six Test wickets are all batsman in the top five." More from young Joe Root, the Charlie Bucket of this England team. Has he got the Golden Ticket that will finally get them into the middle order? Not yet, and we very nearly have a clip for 'When Relay Fielding Goes Bad' as Chris Jordan almost gets in the way of Ben Stokes's bullet arm on the off-side boundary. You don't want to be standing in front of that thing, it's like a rocket launcher. The action may be slow-going but, as this picture tweeted by Test Match Special suggests, the crowd seem to be enjoying soaking up the Grenada sunshine. Seven minutes until tea. Spin at both ends, so we may get through three overs. Moeen to bowl the first of them. Darren Bravo decides he's had enough of cautious accumulation and smacks him to the boundary at cow-corner. Moeen then gets one to spit out of the footmarks and elude Jos Buttler on its way to the boundary. "Joe Root has a bit of a golden arm. There's not been much help for Moeen Ali but perhaps Root can take some of the confidence from his magnificent 182 not out into his bowling." The cap is off. The shades are off. The shinpads are off. The golden boy is on. Here's Joe Root with a bit of part-time tweak. He begins with a maiden. "As a seamer on this pitch England need to be patient, patient, patient and keep bowling at the stumps. Stuart Broad sets himself high standards and doesn't like going for a boundary. He hates it." These two batsman are proving harder to get out than the last Pringle at the bottom of the tube. Brathwaite brings up the 100 partnership with - stop me if you've heard this one before - a late cut past point. Are England feeding his cut shot in the hope of a drag-on, which we've seen a lot in this match? Dangerous little game if so - this is a man who averaged 79 in Tests last year. Two men on the drive for Moeen, England looking for the dismissal that did for Chanderpaul against Tredwell in Antigua. The spinner is still struggling to hit a consistent area though, and Brathwaite late cuts through third man for three. Rob Cobban: AB de Villiers - national junior swimming record, rugby captain, hockey, football, Davis Cup tennis. 100m record. Oh and cricket. Joe Root is warming up, time for the Golden Child surely? But first, Stuart Broad is back. Brathwaite reaches an impressively dogged and mature fifty with a cut in front of point. Rob in Sunbury: Bernard Harrison played for Hampshire in '61 Championship winning team and football for Southampton, Crystal Palace. Badminton - Worcestershire junior champion, Hampshire County player. Table tennis Hampshire seniors. Hockey - invited to play for Hampshire. 9 handicap at Golf. Musical too - played the piano and the spoons! Like a disobedient puppy, West Indies just won't roll over. Brathwaite inches closer to his half-century with a single to cover. Paul Dickson: David Acfield, almost legendary Essex off spinner, won a fencing gold medal at the 1970 Commonwealth Games. Well, this has been a chastening session for England - at lunch it was all gravy, but the West Indies have fought back well, and will be beginning to entertain faint thoughts of setting England a stiff fourth-innings target. Bravo adds two through midwicket - can these two get through to tea? Liam Morgan: Are England and Australia the only two countries who sell out Test cricket arenas? Seems everyone else stays at home. Moeen Ali, still searching for rhythm, like a ballroom dancer vainly trying to bust some shapes at an acid house rave. The West Indian batsmen, having negotiated that mini run-drought well, milk three singles. Tom in Manchester: There can't have been many better than Max Woosnam. He captained the Manchester City and England football sides, has an Olympic Gold medal for tennis, scored a century for a public schools XI at Lord's against the MCC, made a 147 break in snooker and beat Charlie Chaplin at table tennis with a bread knife! Not a bad list of achievements. The runs have dried up for the West Indian batsmen since they slaked their thirst at the drinks break, but Jordan finally releases the pressure with a short wide delivery which Brathwaite uppercuts over backward point for four. David in Spain: Willie Watson (Sunderland and England) (Yorks and England) springs to mind as a double international. And the BBC's brightly remembered Trevor Bailey played football - for Corinthian Casuals, I think. Moeen Ali, looking to keep England's foot on the West Indies throat here. Brathwaite loosens the stranglehold ever so slightly with a single to extra cover. Nigel: Ali & Jordan are wholehearted cricketers but Test match bowlers they are not. Please tell me how these two are a better option than Plunkett, Rashid or Woods? The pressure almost tells when Darren Bravo tries a big shot to the first ball of Jordan's over, but it's not timed, and fielded sharply at extra cover. Bravo plays out a fourth maiden - will the naturally fluent left-hander be getting a bit anxious? "It's made for someone to try right-arm round the wicket, cutters. We're wondering why Joe Root hasn't had a bowl." Mo Ali, mo' dot balls. Six of them, to be precise - three maidens in a row now. Chris Jordan really does have a magnificently well-developed fast bowler's backside - there's a man who doesn't have to borrow a sofa cushion to attend a Kim Kardashian-themed fancy-dress party. Bravo defends stoutly for another maiden. Will in Notts: Regarding the multi talented CB Fry, I believe he was once offered the throne on Albania. Has any other cricketer been offered the crown of a small country? Brathwaite nearly tumbles into the trap - flighted from Moeen and the batsman mistimes his drive just past the man at short midwicket. Nearly, nearly. "India is a great example. 1 billion people, everyone nuts about the game. T20 is on, the grounds are all full - men, women and children, loving every minute. At the Tests, the grounds are empty." Will drinks break the impressive concentration of this West Indies duo? "Bang bang, lads," shouts Jos Buttler, anticipating the morale-boosting effect of two wickets in quick succession. Jordan replaces Stokes - one wholehearted all-rounder for another - and Brathwaite keeps the score ticking with another four past point. Nomads TTC: Forget Dennis Compton playing multi-sports. Derbyshire all-rounder Wes Durston in the Stamford and Rutland table tennis cup final today! CB Fry, who among his many notable achievements, could leap backwards onto the mantelpiece from a standing start. I still haven't managed that. Brathwaite swipes Moeen into the deep for two, and with West Indies going well and England in need of some inspiration, that will be drinks. Darren Bravo is a sort of James Bond batsman really - he always looks stylish, but you're never convinced he's entirely safe. He chops Stokes to the point boundary and picks up two more with a drive down the ground, but then plays a loose stroke that flies fortuitously just wide of the diving Moeen at gully. "You can do everything in life if you have the will from the top. In cricket, we don't have the will from administrators. We could make better pitches, do something about the crowds, but there has to be the will. The ICC are only really interested in how much they can squeeze out of TV. They think that solves everything, but it doesn't." Moeen continues. Brathwaite, who with his studious expression, spindly frame and disproportionately large head reminds me of a cartoon schoolkid, blocks out watchfully for a maiden. "England won't mind seeing that, things are happening with Ben Stokes. West Indies might be trying to get after him after what happened over the past couple of days. That might be good for England." Hands on hips and muttered oaths from Ben Stokes as Brathwaite brings up the 50 partnership with a slash through gully. The bowler nearly has his revenge though, wanging one down into the blockhole that Bravo does well to get a sliver of bat on before it cannons into his pad. Darren Jenkins: Moeen looks unfit. Doesn't look that clever an idea to rush him over after a muscle tear. Moeen Ali, who bowled a rather sloppy over before lunch, gets his chance. It's a better second over from the spinner, rushing through a maiden. Stokes, who's just one wicket away from facing his old adversary Marlon Samuels, looks perplexed as Brathwaite dabs him past gully for four. He's not the most convincing batsman, Brathwaite, dangling the bat almost apologetically outside off stump, but he's moving along effectively here. James: Is there anything England can do and have the fans be happy? Ever? No other nation has such fickle fans. Jordan continues. Runs are beginning to flow for the West Indies as England's change seamers operate - three for Bravo with a mistimed cut, and then four with a cute flick round the corner, down to fine leg. "England are trying to target than chest-region of Brathwaite, that's how they got him in the second innings at Antigua. West Indies have been riled by Stokes, which might create an opportunity for England." It's a double change as Ben Stokes comes on for Jimmy Anderson. Not a great start for the Durham man - his first ball is clipped down to the fine-leg fence by Brathwaite and his second is flayed backward of point, just beating Moeen to the rope. Did Moeen chase it hard enough? Let's just say his sunhat didn't come off - if that had been Brendon McCullum in pursuit, he'd have lost the hat, intercepted the ball with a commando roll and kept it to two. "I've never seen that before, artificial grass nailed into the take-off area. How will the players' spikes take it?" After all that, Jordan replaces Broad, and sends down a maiden over. Mixitnfixitman: I bet Cook's score doesn't look that shabby now given what the rest of the team managed. A turning point for the series? Brathwaite relieves the pressure slightly by driving Anderson down the ground for two. But the opener still looks a little discombobulated after that bouncer from Broad, but he manages to survive a testing over. "Buttler started to move down the leg side, if he hadn't have done that he may have been able to dive in front of Cook. Having said that, it did fall way short." Broad has decided to move slightly wider on the crease to avoid those pesky footholes. Less chance of an LBW, more chance of averting a sprained ankle - that's the trade-off. West Indies have been rather becalmed here, and Jonathan Trott keeps the wind out of their sails with an excellent diving stop at extra cover. The pressure tells as Broad gets one to surprise Brathwaite with extra bounce and the opener gloves it agonisingly short of the slips. Good start by England after lunch. "In the England dressing room, we used to call getting run-out by one of your team-mates being barbecued. I was putting references to burgers and sausages on Twitter earlier." Broad's still chuntering away - now he seems to be unhappy about the footmarks at the bowling crease. He'll have to stew on it down at fine leg for an over. Anderson has settled into a nice rhythm here, and sends one fizzing just Bravo's outside edge. He's not happy, Stuart Broad. He wants something out of the dressing room, but resident drinks-carrier and general dogsbody Mark Wood has no idea where it is. Wood trots off in his fluorescent vest to relay Broad's displeasure over the missing item to Peter Moores. Whatever could it be? Lucky sweatband? Zinc suncream? Personal copy of Marcus Aurelius's Meditations? Whatever it is, Broad's going to have to carry on without it. Still, he manages to find the mark with a good, accurate maiden over. Maurice: England 464. Good. Yet once again 4 plus extras scored nearly all the runs. Great innings from Root; except that he was involved in 3 run-outs. So how many runs did that cost? When will we see some general consistency? Anderson, that familiar swept-back quiff bobbing in his delivery stride, tongue pressed against the corner of his mouth in concentration, runs in. He foxes Brathwaite with an absolute doozy, which looks like coming in but just holds its line, before the opener gloves one that flies just beyond the reach of short leg. "When I first played, even my agent said you might only play a handful games, so enjoy it. Every game, I thought it might not be my last. That way, you almost find the secret. Not by not caring, but by not being nervous." Stuart Broad begins from the other end. Brathwaite adds one to the score with a push to cover. Mike B: Anyone noticed how close the averages are of England's opening batting and bowling partnerships? Cook 45.65 and Trott 45.38; Anderson 29.77 and Broad 30.04. Brathwaite pokes the first ball after lunch through the covers for one. Bravo, who began very positively before lunch, doesn't take long to register his first boundary after the interval - nudging one down the fine leg. The wicket of Devon Smith before lunch was a perfect fillip. England will be hoping for more after the interval, but this West Indies batting line-up has proved redoubtable - and spinner Moeen Ali still looks a pale imitation of the bowler who took 19 wickets against India. Thank you Stephan. Is it just me, or did that England innings feature an unusually high tally of comical dismissals? We had a Moeen run-out last night that would have had kamikaze pilots shaking their heads at its sheer suicidal silliness, Ben Stokes walking off while Marlon Samuels saluted like a war veteran hailing a passing cortege, Stuart Broad standing in statuesque incredulity as Billy Bowden turned down his hopelessly over-optimistic review, and then Jimmy Anderson sauntering rather too lackadaisically into his crease like a man strolling to the newsagents on a Sunday morning - much to Joe Root's disgust. There can't be any more memorably bizarre dismissals left in this match - can there? So, not long before the player emerge for the evening session and, I suspect not long before you can officially start your weekend. For that happy time, James Gheerbrant will be in the chair. Sim: Jimmy Anderson showing his class here. The vital early breakthrough just what England needed. Grenadian journalist and pastor Stevenson Worm: "We Caribbean people, we have a natural rhythm, not like you Brits." Jonathan Agnew: "You haven't seen me dance." Joe Root remained, 182 not out, denied the chance of a double hundred by James Anderson's inability to run his bat in. Anderson made amends by persuading Devon Smith to play on in the third over. West Indies 22-1 at lunch, some 143 runs behind. If you're just joining us, where've you been? You missed England moving along from their overnight 373-6, to be bowled out for 464. There was all manner of bizarre dismissals - Anderson and Jordan run out, Jos Buttler stumped by a miles and Stuart Broad doing his regular trick of reviewing a decision that only he thought was incorrrect. John Pool: 5 minutes from leaving work on my birthday, England actually with a decent sniff of winning a test match. What could be better? Beth in York: This weekend is the University of York versus Lancaster University Varsity. It's Yorkshire against Lancashire. White Rose versus Red Rose. Roses battles ain't just for cricket. My happiness this weekend rests on York winning and England winning. So, no pressure sport. No pressure. On TMS during the interval, Aggers is going to be finding out more about Grenada, the Spice Island on which this match is being played. He's talking to Stevenson Worm, local journalist, cricket commentator and pastor. "Excellent session for England. Root played beautifully, he took control straight away. There was obviously some intent from the captain to get on with it, and that was right. It might be a struggle this afternoon, I'll be very surprised if West Indies collapse." James Anderson gave Joe Root a little cuddle as they left the field, Root may have forgiven him for that run-out now Jimmy has taken an early wicket. The end of an eventful morning, lunch taken after Bravo smears a horrible Moeen full toss through mid-wicket for four. 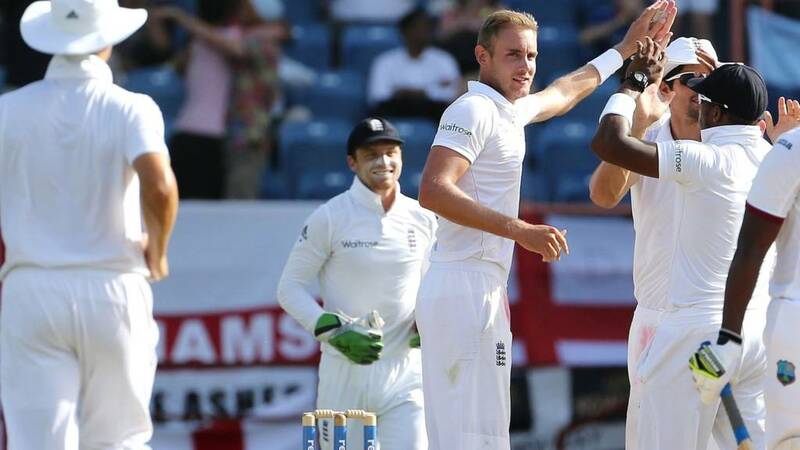 The game has moved on apace on this fourth day, England bowled out for 464 then taking an early Windies wicket. Can England push for that first away win since 2012, or will the Windies dig in? "England want Bravo to be aggressive. Let him strike, you don't mind five or six fours, wickets are all that matter." Slip, gully and short leg for Moeen, round the wicket to leftie Bravo. He hasn't had the best match, Moeen, but a loopy full ball almost has him in the game, with a thick edge past Ian Bell at gully. If that wasn't convincing from Bravo, the next shot is, a drive down the ground for four. England won't mind seeing that. Three balls to go. Ed Mehen: Please can today be that day when the English bowlers run through their opponents' batting order? I'm busy tomorrow. Kraigg Brathwaite actually looks quite organised at the crease, his average in the calendar year of 2014 was 77.9. He's not so good at avoiding the unplayable inswinger, mind. Early apologies to Kraigg if I've mockered him. A single apiece to him and Bravo, with the crouching right-hander then taking a couple through mid-wicket. One to go before the break, looking set to be bowled by Moeen Ali. "Bravo is a decent player, but this is a good time to get him in - our two big-name bowlers can go at him now, and again after lunch." Stuart Broad, with the Barmy Army telling us that he's better than his dad and a backward short leg for the right-handed Brathwaite. Indeed Broad is going a little wide of the crease, but a Brathwaite single is followed by a flourishing clip through the leg side by left-hander Bravo. Maybe two overs to go before lunch. How England would like to see Marlon Samuels walking out before then. Jamie Green: Okay, Jimmy has just made up for the run-out! James Gutteridge: Jimmy Anderson, all is forgiven! Matthew Bennett: Anderson is giving us hope on the most placid of pitches. "Great start for England - that puts the West Indies under so much pressure. They've got some batting to do now." Smith correctly picked that the ball was moving away from him, but his shuffle backwards and withdraw of the bat was all over the place. Replays show the ball actually hit leg stump, rather than off. England have taken advantage of the early movement to have the wicket they craved before lunch time. Darren Bravo is the new man, negotiating one ball with five slips for company. Is victory today possible? "In this Test match, with the low slow surface, it seems the best way to get a dismissal is to get people to play on. As the ball pitched and bounced, Smith looked to leave it, but his bat wasn't high enough - you've got to get your bat out of the way." Mike Bell in Ashford: Dad served in WW2 in the Royal Navy, and my brothers and I used to have to salute him when he came 'on board' to bat playing cricket in the back garden. On one of the very rare occasions I managed to get Dad out, my youngest brother then saluted me. Dad was somewhat immature in his response, as he grounded my brother for the day for 'downright insolence', and then took the bat indoors. No idea what he'd have made of yesterday's shenanigans. Stuart Broad to share the new ball - he and Anderson will have about 20 minutes of bowling to do before they have lunch. We're keeping a close eye on Broad in this innings, he said an adjustment in the first innings, bowling wider on the crease, had him bowling with greater pace. Hmmm, no great speed at the moment, down at 77mph, but there is some swing into the left-handed Smith. Perhaps a touch too leg side, so no great threat. "There have been 2.3 wickets per session so far in this Test series. With only five sessions left, it's not going to be easy to force a victory." Finally we get under way, with three slips and a gully waiting in the sunshine. The odd honk of a horn, England very chirpy as Anderson shapes the ball away from the right-handed Brathwaite. Ben Stokes is doing a lot of animated clapping, I notice. We start with a maiden. There are 74 overs to go today, so plenty of time for England to make inroads. Who knows, maybe even better than that. Ah, finally the players emerge, James Anderson unscathed enough to take the new ball. Devon Smith and Kraigg Brathwaite will open the batting - it was Brathwaite that Jimmy bowled with a rozzer in the first innings. They do battle again here, waiting for the roller to trundle off. Dom Tulett in Fulham: Played against former India keeper and occasional opening batsman Deep Dasgupta in a Norfolk club game a few years ago. After he'd scored a chanceless 50-odd one of our team punned that "If we don't get a wicket soon, we'll be in 'deep' trouble." Dasgupta turned, chuckled, and was out next ball. "Joe Root does have energy and dynamism at the crease - but there are times when he turns and looks as though he's going for a second run, and I think that some of his batting partners feel the same." I'm hearing that there is a five-minute delay. No idea why. It might be that they have to prevent Joe Root from attacking James Anderson. "Joe Root has converted four of his six hundreds into 150+ scores. Only three players in Test history have an equal or better conversion rate: Dennis Amiss, Zaheer Abbas and Cheteshwar Pujara." "Joe Root is nowhere near as good as AB De Villiers yet, but he has the potential to be that type of player in the middle order. He may move up to four in the future, who knows." Perhaps Jimmy just fancied a bowl. It certainly took the England balcony by surprise - Alastair Cook didn't even have his whites on. What do we expect from the rest of the day? England wickets, or Windies occupation? With the sun out, it still feels like a time to be batting. Andy Zaltzman on Twitter: The last time England had three batsmen run out in the first innings of a Test was in Adelaide, 1901-02. Eliot Batchelor: Silly by Jimmy Anderson. You should always make the effort. Sam Needham: Jimmy that is absolutely schoolboy stuff, you owe Joe Root a beer or six for that. Barney Thompson: It would be fair to say Joe Root is a trifle upset - and no wonder! Jimmy had better take some wickets now to compensate! "Joe Root's 182 not out is the highest by an Englishman in the West Indies since Dennis Amiss's 262 not out in Kingston in 1974." "Maybe today is the day when West Indies fold and there is a calypso collapso." So, silly run-outs aside, England are 464 all out, a lead of 165. West Indies need to make that many just to make England bat again. Though wickets have fallen with regularity both last night and this morning, they were more down to batsman error than the behaviour of the ball. It still looks good for batting. Can the Windies resist, or are England set to steam towards victory? "I think it's the best thing for the team. Now they can get out there and get 10 wickets. It's a better carrot for the West Indies that last week in Antigua, when all they had to do was block out for a draw." "You don't see many of those in a season, let alone from a man who has 101 Test matches. All he had to do was ground his bat." It's totally bizarre. Coming back for a second run, James Anderson simply made no attempt to make his ground. Maybe he thought the throw would sail over the head of Jason Holder, but the tall bowler leapt to gather, then took the bails off. If Anderson had merely stretched, he would have made his ground - we weren't even asking for a dive. Joe Root is fuming, left high and dry on 182. He blasted the ground with his bat, then threw his helmet as he crossed the boundary. Very dozy from Jimmy. Dukkhaboy: The most enjoyment per run scored is in your teams 10th wicket partnership- the most annoyance is in the opposition's 10th wicket. Andy: Root is not farming the strike to protect Jimmy, but to ensure he reaches his second double century!